Japanese dub band Fishmans barely gained a scrap of reputation during their active years – their music not progressing outside of their home country of Japan during the entire lifespan of the band. Despite this, their discography has garnered a huge cult following, with their live album 98.12.28 Okotachi No Wakare rated by music site RYM as the second best album of 1999, and the 100th greatest album of all time. With their music now available on streaming services for the first time in the history of the band, I’d like to shine a light onto possibly one of the most peculiarly wonderful musical projects the world has to offer – there’s never been a better time to dive deep down into the discography of the wonderfully diverse Fishmans. 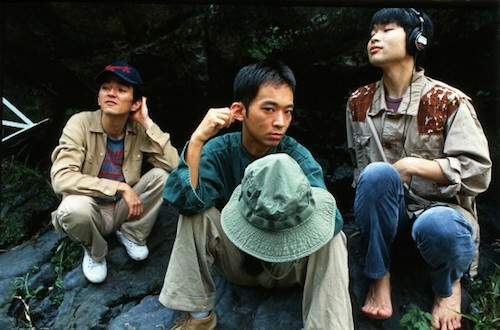 Beginning in 1991 with their debut album Chappie Don’t Cry (and swiftly followed by 1992’s King Master George) Fishmans cemented a reputation as an excellent dub band, with a relaxed, easy-going style that drew in fans across Japan. But it was albums like Aerial Camp and Uchu Nippon Setagaya that truly proved Fishmans were something else, something special – with music that drew on dream pop, experimental rock, shoegaze and ambient music for inspiration – creating one of the most recognisable and unique sonic palates in music over the course of just 4 short albums.’ナイトクルージング’ from Aerial Camp is one of the best examples of how the band seamlessly blends genres, with buzzing, droning guitar feedback sitting just under a gorgeous, relaxing piano melody and steady drums that gently tug the track along. Perhaps the definitive Fishmans experience, however, is their final live album as a full band – 98.12.28 Okotachi No Wakare – an album that is beautiful, disorienting and melancholic all at once. Clocking in at just over 2 hours, 98.12 gives the perfect cross-section of Fishmans’ discography and progression as artists – featuring highlights from across their career and ending with a complete rendition of their sixth album, The Long Season in its entirety. Listening to 98.12 is one of the most otherworldly and alienating experiences you can find on Spotify – an odyssey of sound that truly pushes the listener into bewildering territory. This was my introduction to Fishmans – and everything about this record made me want to learn more about its world – the peculiar, chromatically aberrated cover of Shinji Sato paired with his wailing, androgynous vocals. The way that instruments spring from nowhere into flurries of decadent, sumptuous sound – the way that the production bends around the individual performances and that rock-steady rhythm section keeping it all in check. Introductory track ‘Oh Slime!’ features a variety of vocals that spring out of nowhere alongside chiming chord progressions, and the funky, danceable climax of ‘IN THE FLIGHT’ is blissfully sharp on the live version. The album is covered in blissful moments too – two of which can be found on the live rendition of ‘ナイトクルージング’ opening with a low-passed, hushed vocal performance and ending in a tortured scream with flurries of all kinds of instrumentation blaring. The album is a perfect, crystallised version of a band at their peak – as well as a final hurrah before Shinji Sato’s death just a few months after. There’s something haunting about re-listening to the album with this information on board -Sato’s voice becoming more desloate, more beautiful – a man in his final stages of life, putting his all into creating something timelessly beautiful. After Sato’ death, Fishmans didn’t push to continue its existence – the loss of its auteur a respectful time to stop producing music. However, the band has cared for his legacy better than most – with numerous tribute performances, albums and even art exhibitions in honour of Sato’s genius. Spotify finally making this music more easily available to a western audience continues this wonderful legacy – letting that immortalised performance be shared by not just those who attended, but the whole world.